A footballer has apologised after making "insensitive comments" on social media in the aftermath of the bombing in Manchester. Twenty-two people were killed and another 59 injured in the attack after an Ariana Grande gig on Monday night. 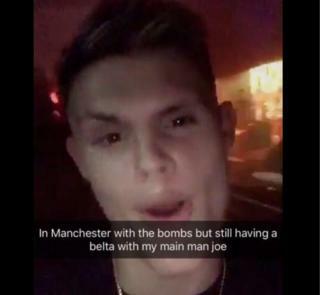 Ipswich Town goalkeeper Harry Wright posted on Snapchat, saying "in Manchester with the bombs but still having a belta with my main man joe". The 18-year said it had been a "massive error of judgment". As reported by the Ipswich Star, Wright's post was highlighted on Twitter. People responded, labelling the post "disrespectful" and "disgusting". "I would like to apologise wholeheartedly for the insensitive comments I made on social media while out in Manchester last night," Wright said in a statement issued by the club. "I wasn't aware of the full situation regarding the tragic events when I made those comments but that is no excuse, it was a massive error of judgment and something I deeply regret. "My thoughts and condolences go out to all the victims and their families." Ipswich Town said it was investigating. Club spokesman Jonathon Ogle said: "The club would like to reiterate that our thoughts and condolences are with all those people affected by the deeply tragic events in Manchester last night." Last week, Wright, who has yet to make his first-team debut, was given a new contract by the club.